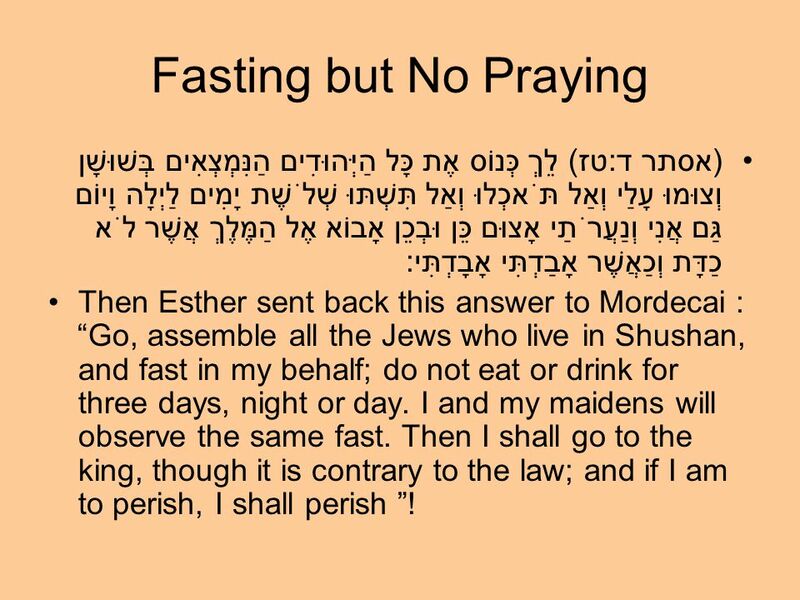 Why Didn't Esther Pray? 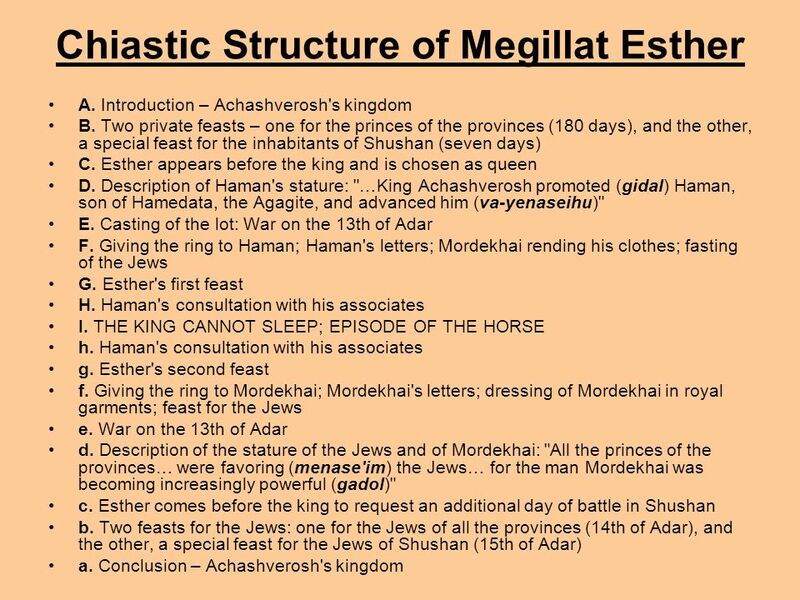 Three Responses to the (Ir)Religiousness of Megilat Esther. 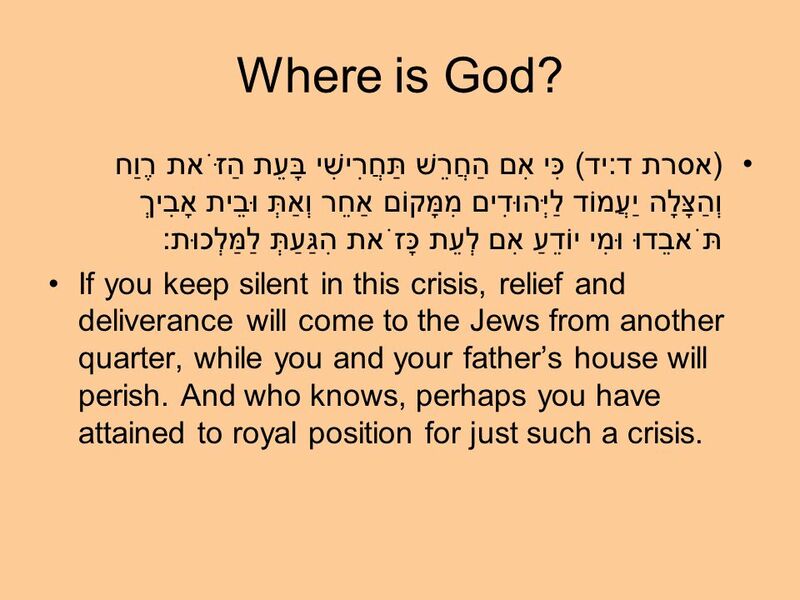 5 Where is God? (אסרת ד:יד) כִּי אִם הַחֲרֵשׁ תַּחֲרִישִׁי בָּעֵת הַזֹּאת רֶוַח וְהַצָּלָה יַעֲמוֹד לַיְּהוּדִים מִמָּקוֹם אַחֵר וְאַתְּ וּבֵית אָבִיךְ תֹּאבֵדוּ וּמִי יוֹדֵעַ אִם לְעֵת כָּזֹאת הִגַּעַתְּ לַמַּלְכוּת: If you keep silent in this crisis, relief and deliverance will come to the Jews from another quarter, while you and your father’s house will perish. And who knows, perhaps you have attained to royal position for just such a crisis. 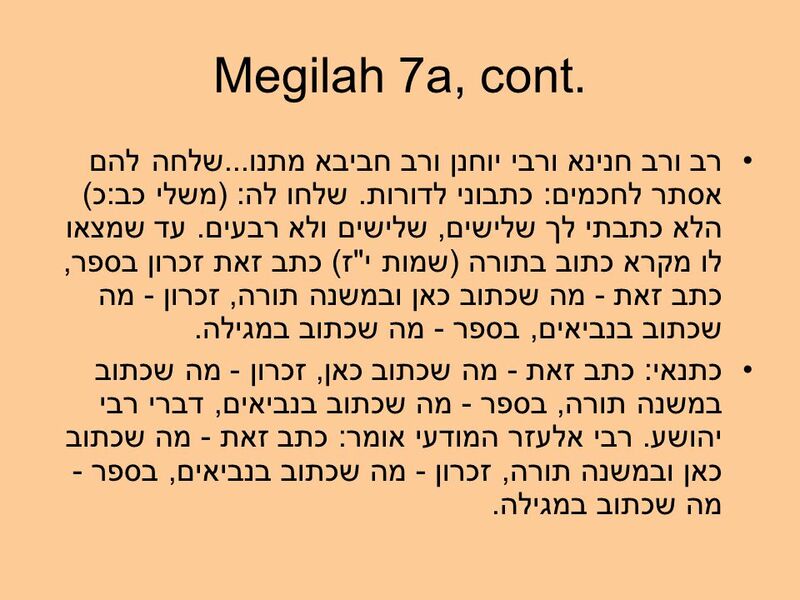 9 Bavli Megilah 7a אמר רב שמואל בר יהודה: שלחה להם אסתר לחכמים: קבעוני לדורות! שלחו לה: קנאה את מעוררת עלינו לבין האומות. שלחה להם: כבר כתובה אני על דברי הימים למלכי מדי ופרס. 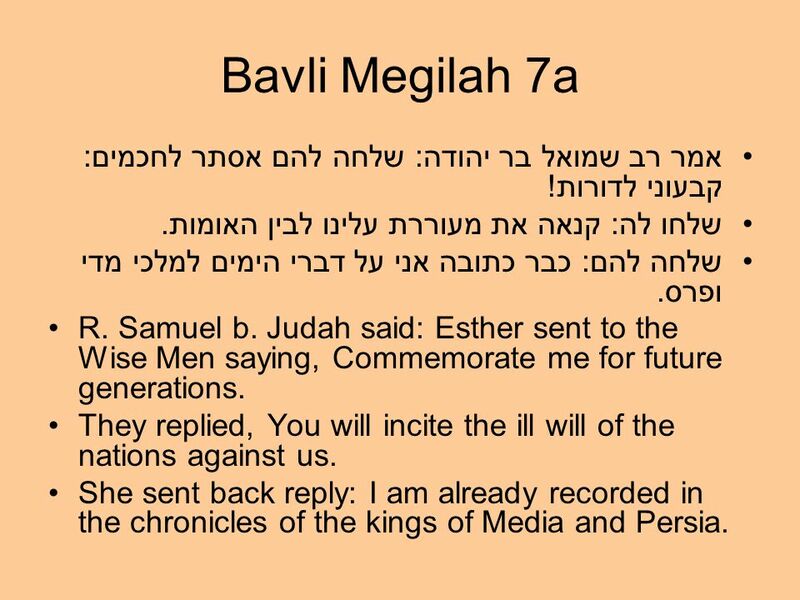 R. Samuel b. Judah said: Esther sent to the Wise Men saying, Commemorate me for future generations. They replied, You will incite the ill will of the nations against us. She sent back reply: I am already recorded in the chronicles of the kings of Media and Persia. 10 Megilah 7a, cont. רב ורב חנינא ורבי יוחנן ורב חביבא מתנו...שלחה להם אסתר לחכמים: כתבוני לדורות. שלחו לה: (משלי כב:כ) הלא כתבתי לך שלישים, שלישים ולא רבעים. עד שמצאו לו מקרא כתוב בתורה (שמות י"ז) כתב זאת זכרון בספר, כתב זאת - מה שכתוב כאן ובמשנה תורה, זכרון - מה שכתוב בנביאים, בספר - מה שכתוב במגילה. כתנאי: כתב זאת - מה שכתוב כאן, זכרון - מה שכתוב במשנה תורה, בספר - מה שכתוב בנביאים, דברי רבי יהושע. רבי אלעזר המודעי אומר: כתב זאת - מה שכתוב כאן ובמשנה תורה, זכרון - מה שכתוב בנביאים, בספר - מה שכתוב במגילה. 11 Megilah 7a, cont. אמר רב יהודה אמר שמואל: אסתר אינה מטמאה את הידים. למימרא דסבר שמואל אסתר לאו ברוח הקודש נאמרה? והאמר שמואל: אסתר ברוח הקודש נאמרה! 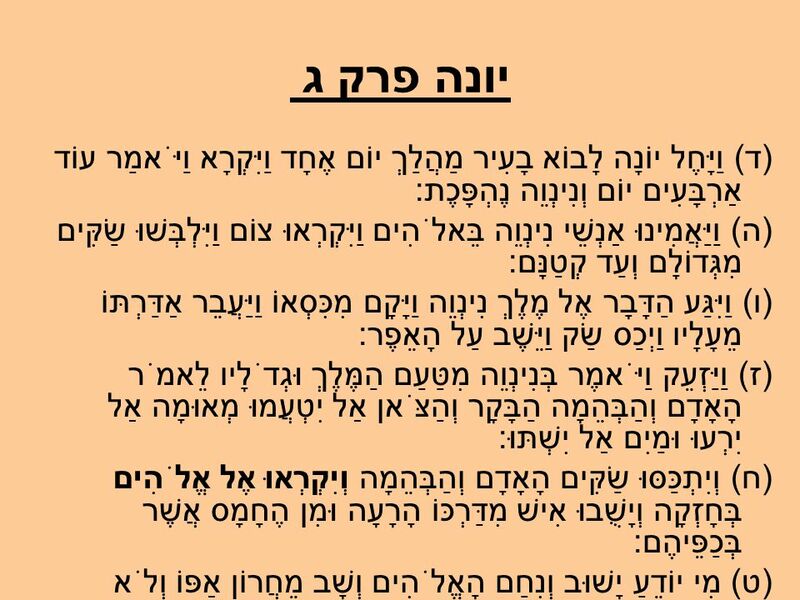 נאמרה לקרות ולא נאמרה ליכתוב. 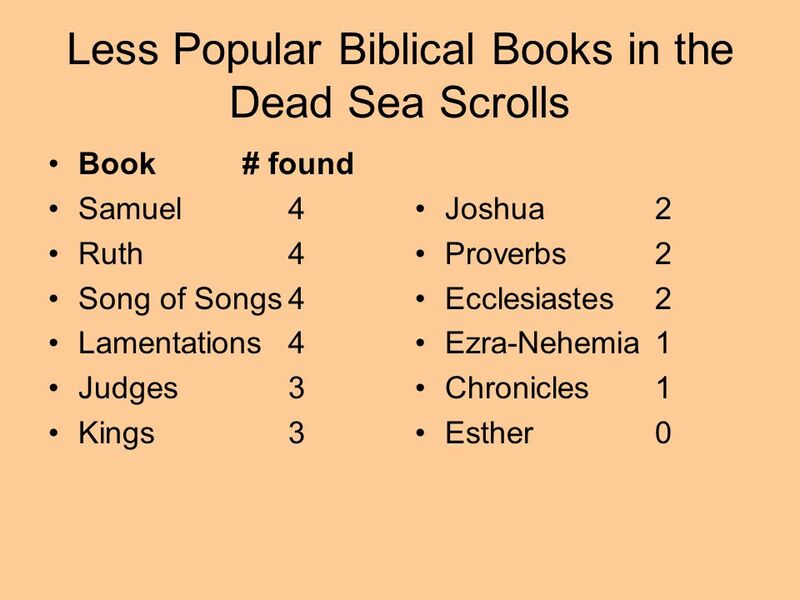 Rab Judah said in the name of Samuel; [The scroll] of Esther does not make the hands unclean. 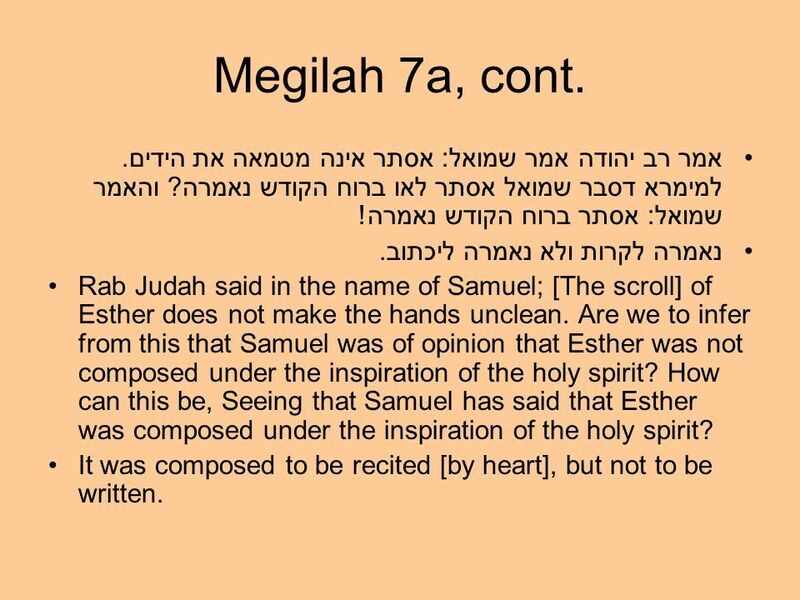 Are we to infer from this that Samuel was of opinion that Esther was not composed under the inspiration of the holy spirit? 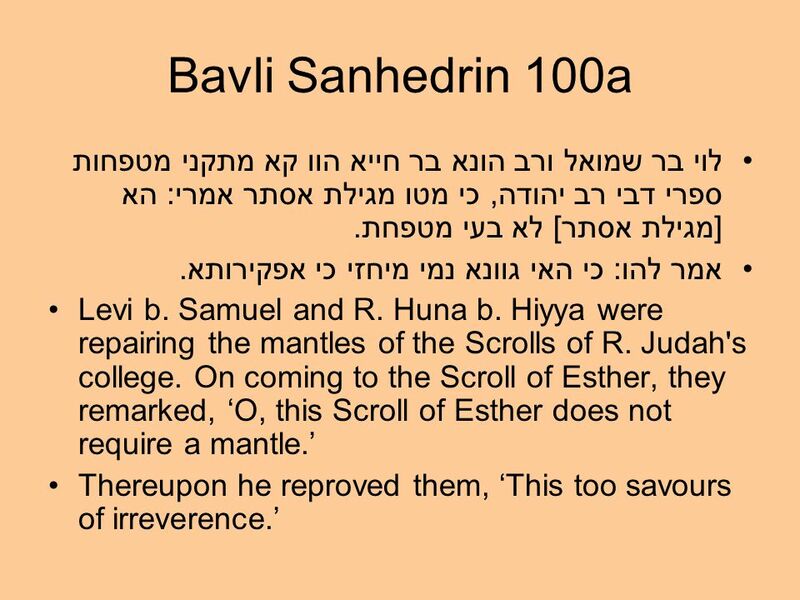 How can this be, Seeing that Samuel has said that Esther was composed under the inspiration of the holy spirit? It was composed to be recited [by heart], but not to be written. 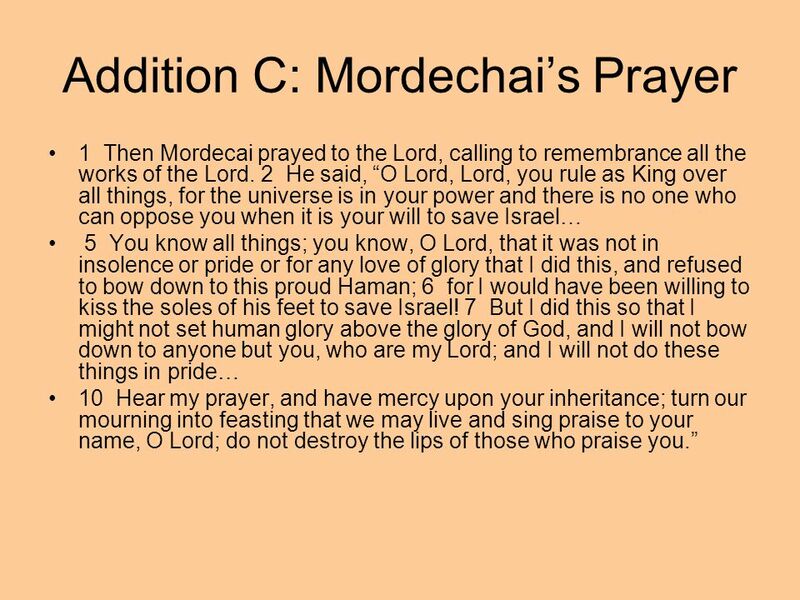 19 Addition A: Mordechai’s Dream 1In the second year of the reign of Artaxerxes the Great, on the first day of Nisan, Mordecai … had a dream. 4 Noises and confusion, thunders and earthquake, tumult on the earth! 5 Then two great dragons came forward, both ready to fight, and they roared terribly. 6 At their roaring every nation prepared for war, to fight against the righteous nation. 7 It was a day of darkness and gloom, of tribulation and distress, affliction and great tumult on the earth! 8 And the whole righteous nation was troubled; they feared the evils that threatened them, and were ready to perish. 9 Then they cried out to God; and at their outcry, as though from a tiny spring, there came a great river, with abundant water; 10 light came, and the sun rose, and the lowly were exalted and devoured those held in honor. 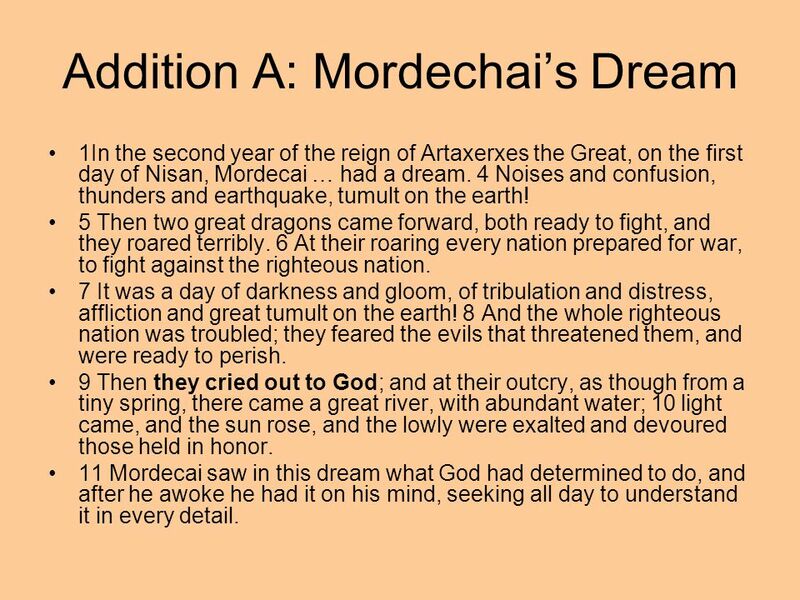 11 Mordecai saw in this dream what God had determined to do, and after he awoke he had it on his mind, seeking all day to understand it in every detail. 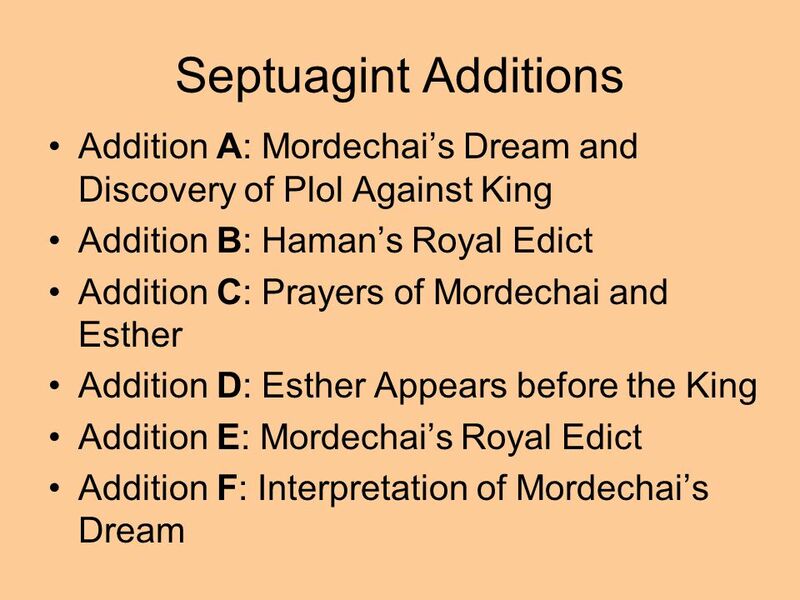 22 Addition D: Esther Appears before the King 1 On the third day, when she ended her prayer, she took off the garments in which she had worshiped, and arrayed herself in splendid attire. 2 Then, majestically adorned, after invoking the aid of the all-seeing God and Savior, she took two maids with her; 3 on one she leaned gently for support, 4 while the other followed, carrying her train. 5 She was radiant with perfect beauty, and she looked happy, as if beloved, but her heart was frozen with fear. 6 When she had gone through all the doors, she stood before the king. He was seated on his royal throne, clothed in the full array of his majesty, all covered with gold and precious stones. He was most terrifying. 7 Lifting his face, flushed with splendor, he looked at her in fierce anger. The queen faltered, and turned pale and faint, and collapsed on the head of the maid who went in front of her. 8 Then God changed the spirit of the king to gentleness, and in alarm he sprang from his throne and took her in his arms until she came to herself. He comforted her with soothing words, and said to her, 9 “What is it, Esther? I am your husband. Take courage; 10 You shall not die, for our law applies only to our subjects. Come near.” 11 Then he raised the golden scepter and touched her neck with it; 12 he embraced her, and said, “Speak to me.” 13 She said to him, “I saw you, my lord, like an angel of God, and my heart was shaken with fear at your glory. 14 For you are wonderful, my lord, and your countenance is full of grace.” 15 And while she was speaking, she fainted and fell. 16 Then the king was agitated, and all his servants tried to comfort her. 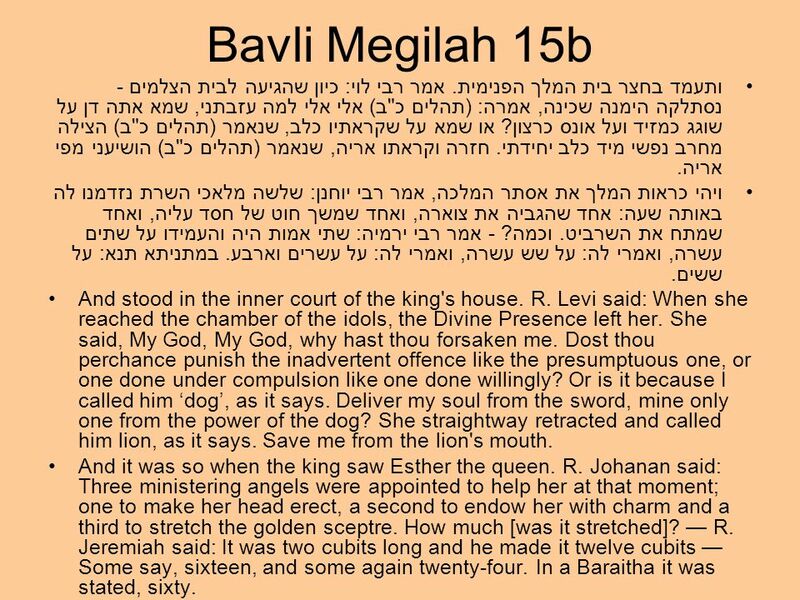 23 Bavli Megilah 15b ותעמד בחצר בית המלך הפנימית. אמר רבי לוי: כיון שהגיעה לבית הצלמים - נסתלקה הימנה שכינה, אמרה: (תהלים כ"ב) אלי אלי למה עזבתני, שמא אתה דן על שוגג כמזיד ועל אונס כרצון? או שמא על שקראתיו כלב, שנאמר (תהלים כ"ב) הצילה מחרב נפשי מיד כלב יחידתי. חזרה וקראתו אריה, שנאמר (תהלים כ"ב) הושיעני מפי אריה. ויהי כראות המלך את אסתר המלכה, אמר רבי יוחנן: שלשה מלאכי השרת נזדמנו לה באותה שעה: אחד שהגביה את צוארה, ואחד שמשך חוט של חסד עליה, ואחד שמתח את השרביט. וכמה? - אמר רבי ירמיה: שתי אמות היה והעמידו על שתים עשרה, ואמרי לה: על שש עשרה, ואמרי לה: על עשרים וארבע. במתניתא תנא: על ששים. And stood in the inner court of the king's house. R. Levi said: When she reached the chamber of the idols, the Divine Presence left her. She said, My God, My God, why hast thou forsaken me. Dost thou perchance punish the inadvertent offence like the presumptuous one, or one done under compulsion like one done willingly? Or is it because I called him ‘dog’, as it says. Deliver my soul from the sword, mine only one from the power of the dog? She straightway retracted and called him lion, as it says. Save me from the lion's mouth. And it was so when the king saw Esther the queen. 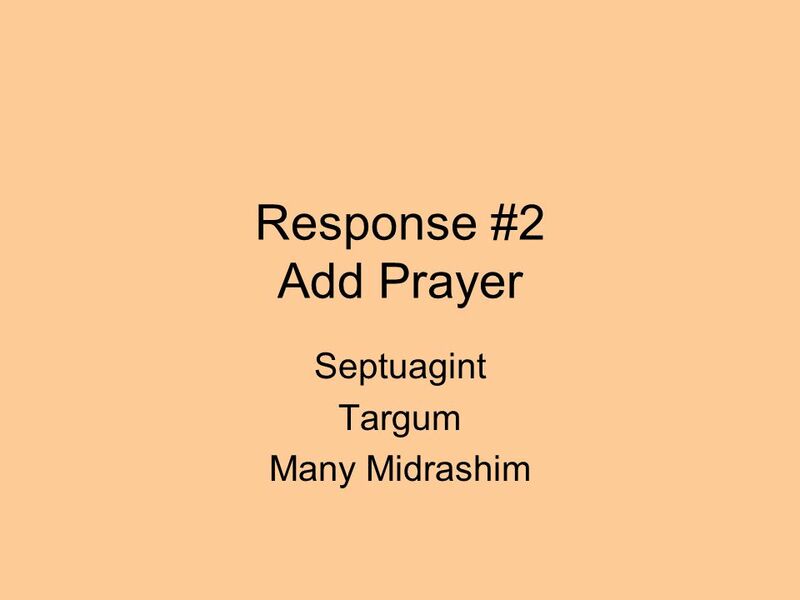 R. Johanan said: Three ministering angels were appointed to help her at that moment; one to make her head erect, a second to endow her with charm and a third to stretch the golden sceptre. How much [was it stretched]? 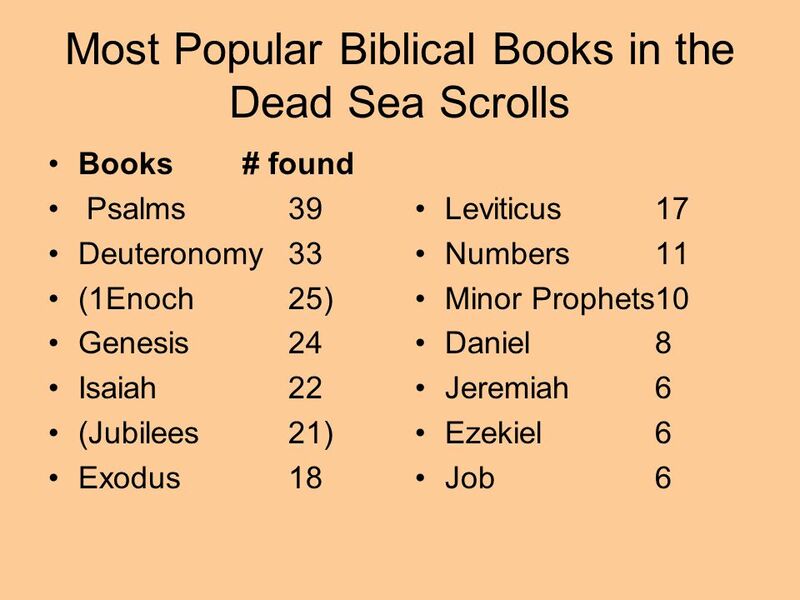 — R. Jeremiah said: It was two cubits long and he made it twelve cubits — Some say, sixteen, and some again twenty-four. In a Baraitha it was stated, sixty. 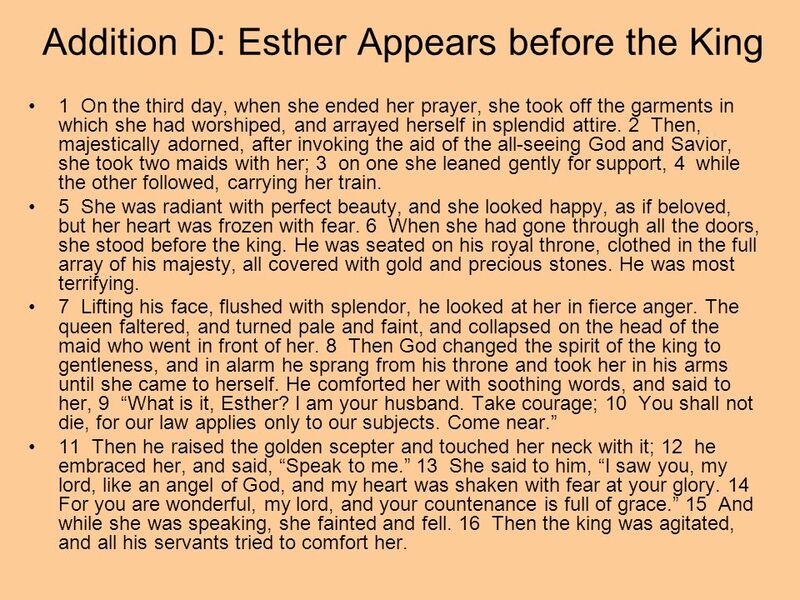 24 How Could Esther Sleep with the King? תלמוד בבלי מסכת סנהדרין דף עד עמוד ב והא אסתר פרהסיא הואי! - אמר אביי: אסתר קרקע עולם היתה. רבא אמר: הנאת עצמן שאני. 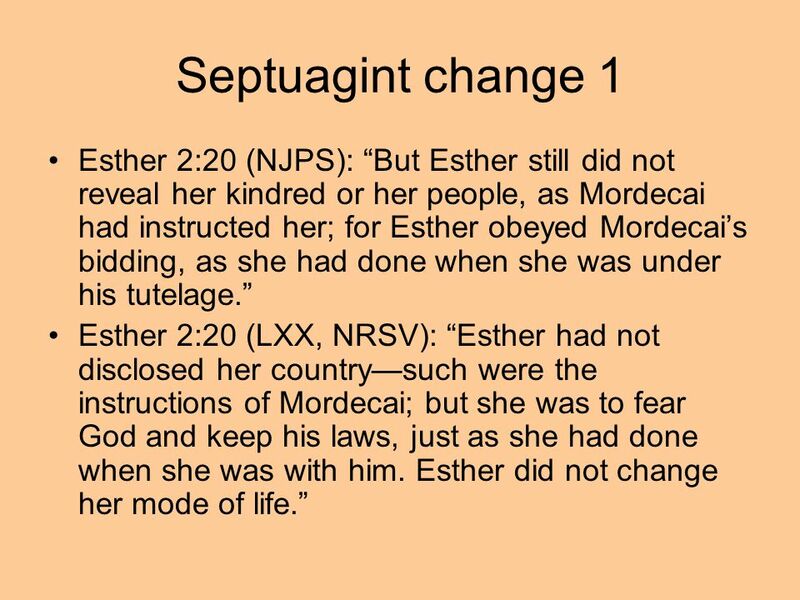 But did not Esther transgress publicly? 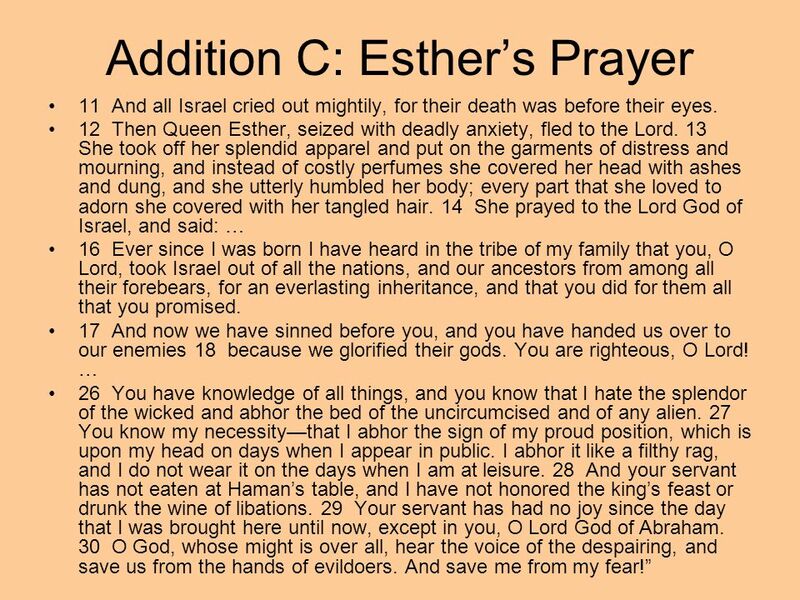 Abaye answered; Esther was merely natural soil. Raba said: When they [the persecutors] demand it for their personal pleasure. it is different. 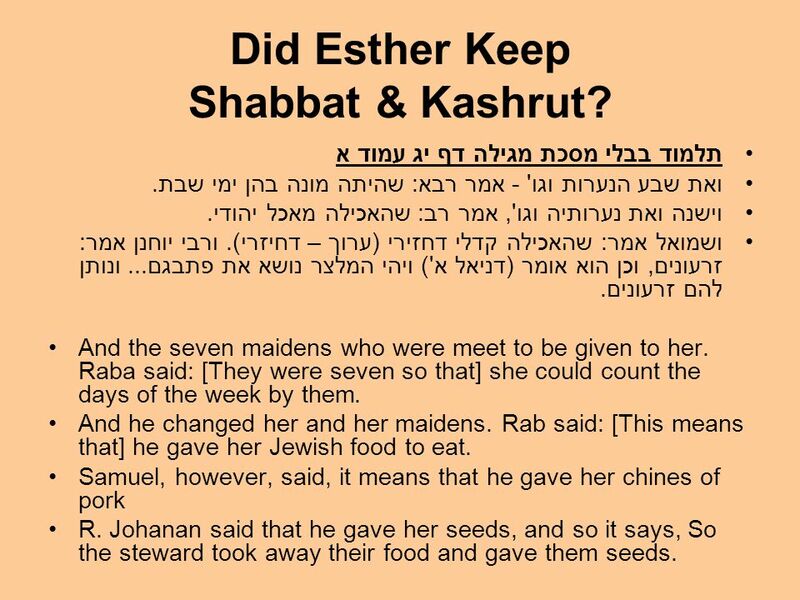 25 Did Esther Keep Shabbat & Kashrut? תלמוד בבלי מסכת מגילה דף יג עמוד א ואת שבע הנערות וגו' - אמר רבא: שהיתה מונה בהן ימי שבת. וישנה ואת נערותיה וגו', אמר רב: שהאכילה מאכל יהודי. ושמואל אמר: שהאכילה קדלי דחזירי (ערוך – דחיזרי). ורבי יוחנן אמר: זרעונים, וכן הוא אומר (דניאל א') ויהי המלצר נושא את פתבגם... ונותן להם זרעונים. And the seven maidens who were meet to be given to her. Raba said: [They were seven so that] she could count the days of the week by them. And he changed her and her maidens. 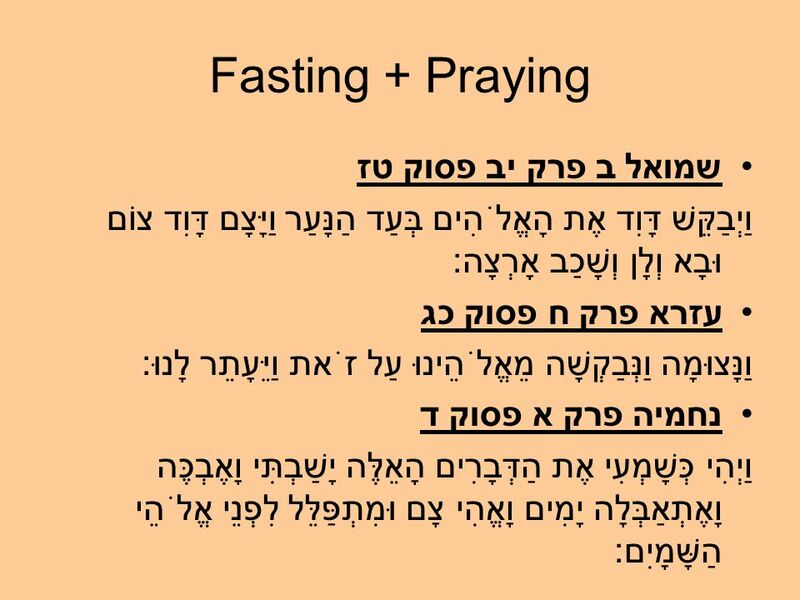 Rab said: [This means that] he gave her Jewish food to eat. Samuel, however, said, it means that he gave her chines of pork R. Johanan said that he gave her seeds, and so it says, So the steward took away their food and gave them seeds. 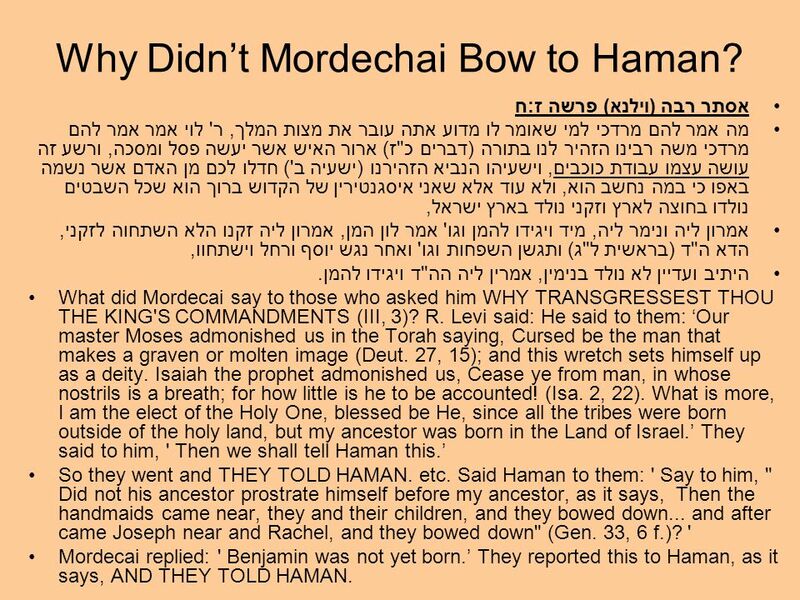 26 Why Didn’t Mordechai Bow to Haman? אסתר רבה (וילנא) פרשה ז:ח מה אמר להם מרדכי למי שאומר לו מדוע אתה עובר את מצות המלך, ר' לוי אמר אמר להם מרדכי משה רבינו הזהיר לנו בתורה (דברים כ"ז) ארור האיש אשר יעשה פסל ומסכה, ורשע זה עושה עצמו עבודת כוכבים, וישעיהו הנביא הזהירנו (ישעיה ב') חדלו לכם מן האדם אשר נשמה באפו כי במה נחשב הוא, ולא עוד אלא שאני איסגנטירין של הקדוש ברוך הוא שכל השבטים נולדו בחוצה לארץ וזקני נולד בארץ ישראל, אמרון ליה ונימר ליה, מיד ויגידו להמן וגו' אמר לון המן, אמרון ליה זקנו הלא השתחוה לזקני, הדא ה"ד (בראשית ל"ג) ותגשן השפחות וגו' ואחר נגש יוסף ורחל וישתחוו, היתיב ועדיין לא נולד בנימין, אמרין ליה הה"ד ויגידו להמן. 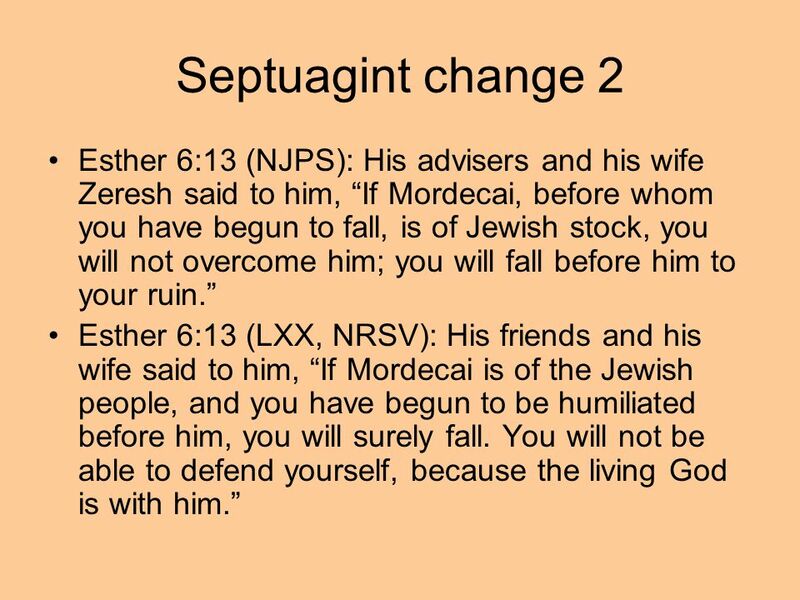 What did Mordecai say to those who asked him WHY TRANSGRESSEST THOU THE KING'S COMMANDMENTS (III, 3)? 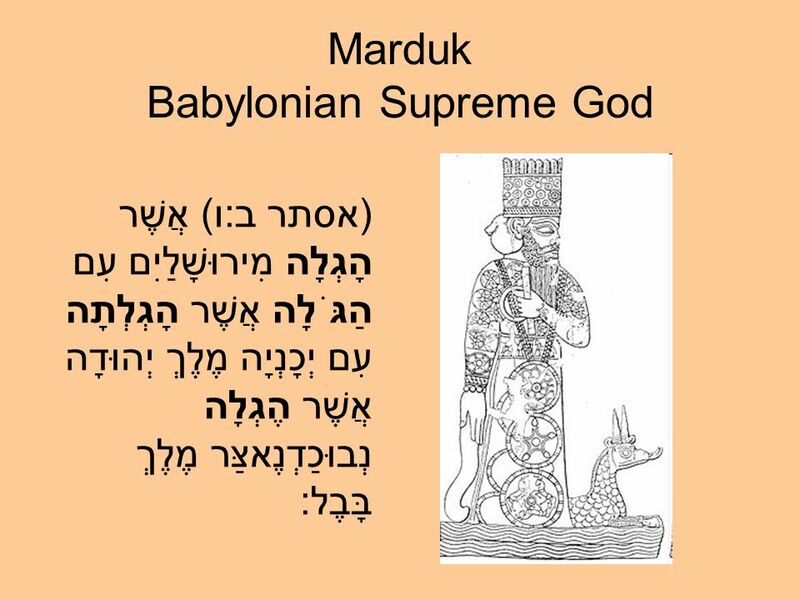 R. Levi said: He said to them: ‘Our master Moses admonished us in the Torah saying, Cursed be the man that makes a graven or molten image (Deut. 27, 15); and this wretch sets himself up as a deity. Isaiah the prophet admonished us, Cease ye from man, in whose nostrils is a breath; for how little is he to be accounted! (Isa. 2, 22). What is more, I am the elect of the Holy One, blessed be He, since all the tribes were born outside of the holy land, but my ancestor was born in the Land of Israel.’ They said to him, ' Then we shall tell Haman this.’ So they went and THEY TOLD HAMAN. etc. Said Haman to them: ' Say to him, " Did not his ancestor prostrate himself before my ancestor, as it says, Then the handmaids came near, they and their children, and they bowed down... and after came Joseph near and Rachel, and they bowed down" (Gen. 33, 6 f.)? ' Mordecai replied: ' Benjamin was not yet born.’ They reported this to Haman, as it says, AND THEY TOLD HAMAN. 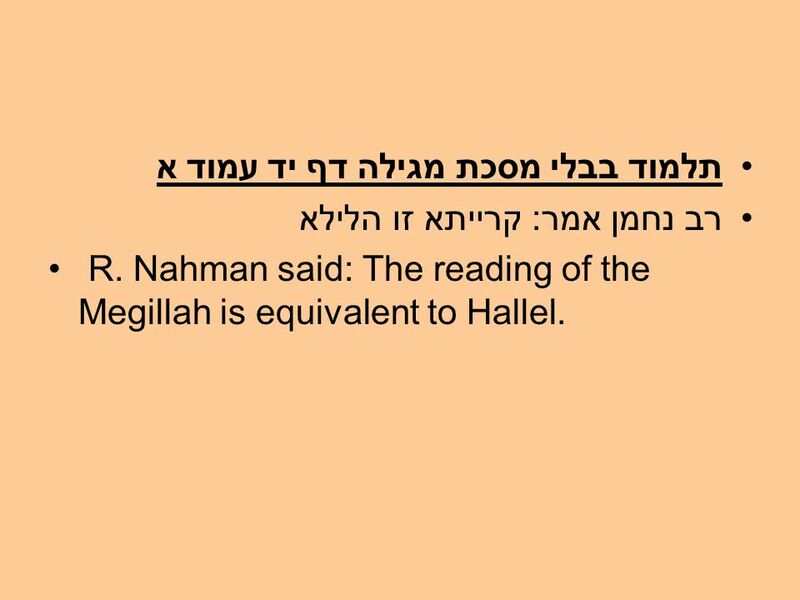 28 Bavli Megilah 13a רבי נחמיה אומר: הדסה שמה, ולמה נקראת אסתר - שהיו אומות העולם קורים אותה על שום אסתהר. 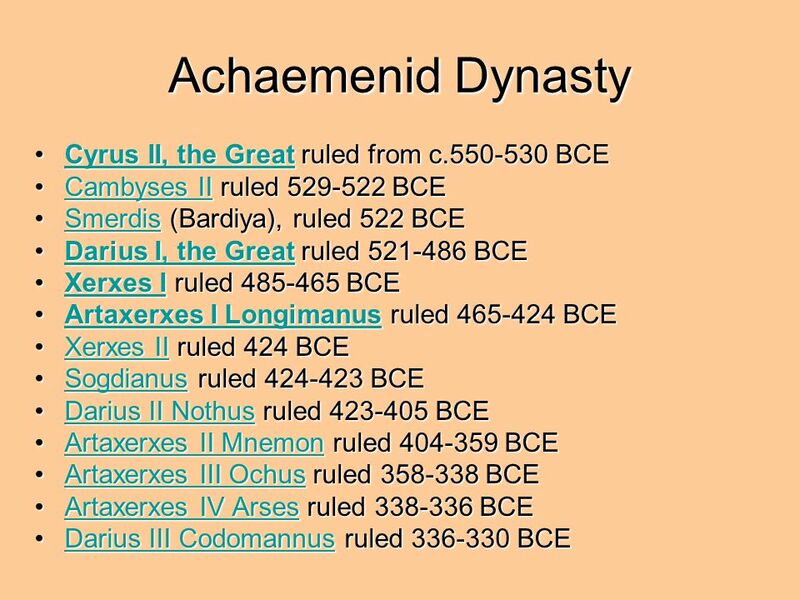 R. Nehemiah says: Hadassah was her name. 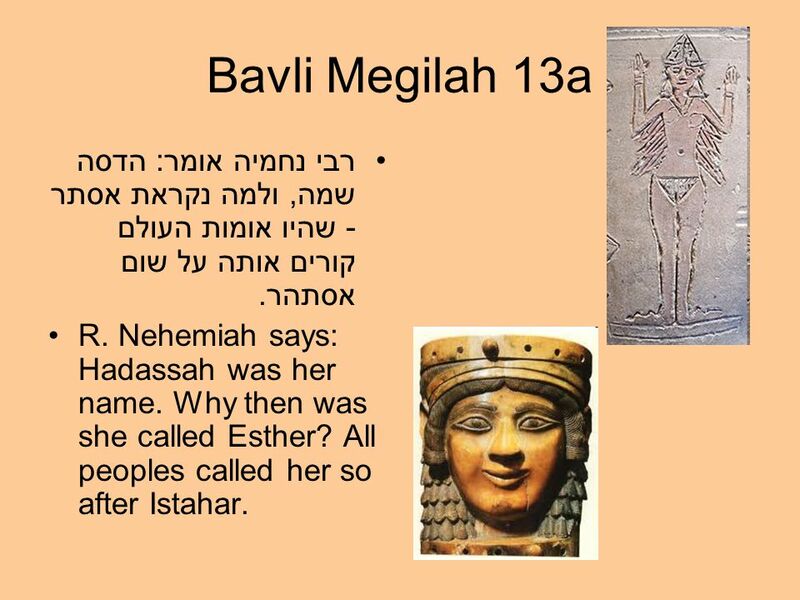 Why then was she called Esther? All peoples called her so after Istahar. 31 Using Temple Vessels בבלי מגילה יב ע"א והשקות בכלי זהב וכלים מכלים שונים - משונים מיבעי ליה! אמר רבא: יצתה בת קול ואמרה להם: ראשונים כלו מפני כלים ואתם שונים בהם? 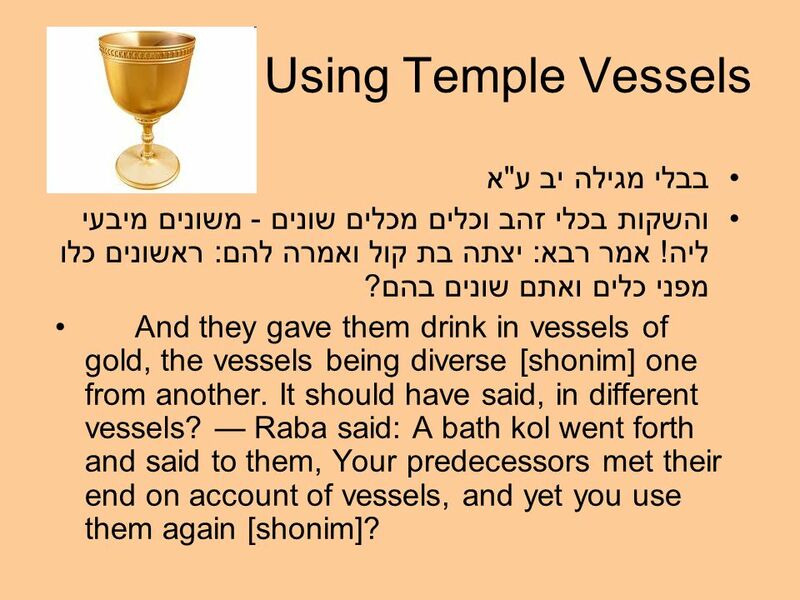 And they gave them drink in vessels of gold, the vessels being diverse [shonim] one from another. It should have said, in different vessels? — Raba said: A bath kol went forth and said to them, Your predecessors met their end on account of vessels, and yet you use them again [shonim]? 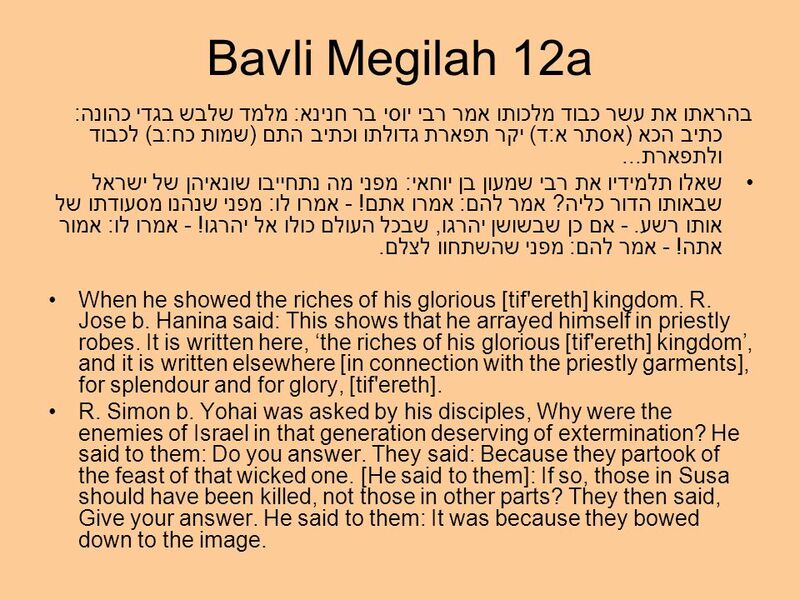 32 Bavli Megilah 12a בהראתו את עשר כבוד מלכותו אמר רבי יוסי בר חנינא: מלמד שלבש בגדי כהונה: כתיב הכא (אסתר א:ד) יקר תפארת גדולתו וכתיב התם (שמות כח:ב) לכבוד ולתפארת... שאלו תלמידיו את רבי שמעון בן יוחאי: מפני מה נתחייבו שונאיהן של ישראל שבאותו הדור כליה? אמר להם: אמרו אתם! - אמרו לו: מפני שנהנו מסעודתו של אותו רשע. - אם כן שבשושן יהרגו, שבכל העולם כולו אל יהרגו! - אמרו לו: אמור אתה! - אמר להם: מפני שהשתחוו לצלם. When he showed the riches of his glorious [tif'ereth] kingdom. R. Jose b. Hanina said: This shows that he arrayed himself in priestly robes. It is written here, ‘the riches of his glorious [tif'ereth] kingdom’, and it is written elsewhere [in connection with the priestly garments], for splendour and for glory, [tif'ereth]. 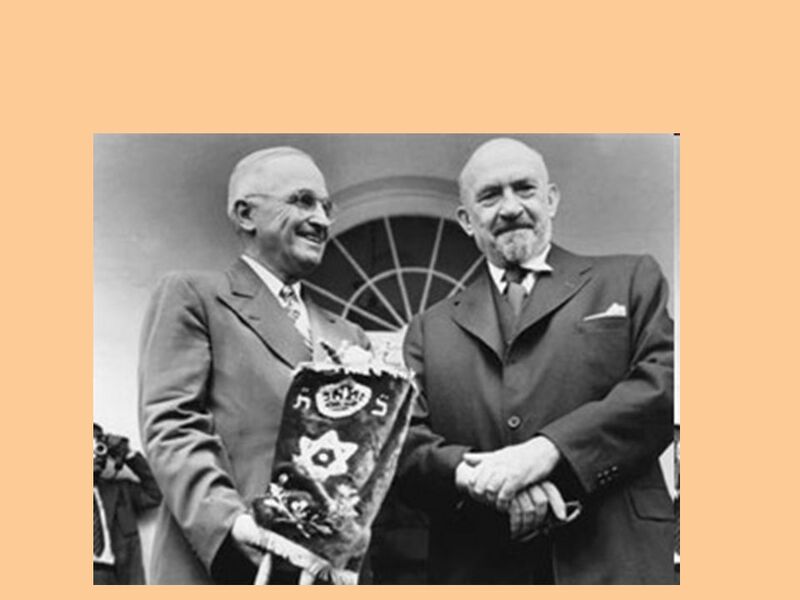 R. Simon b. Yohai was asked by his disciples, Why were the enemies of Israel in that generation deserving of extermination? 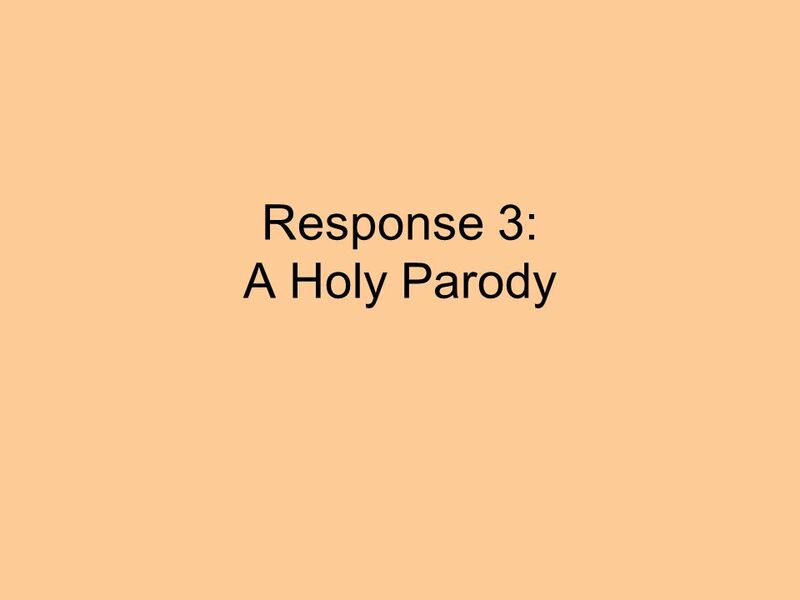 He said to them: Do you answer. They said: Because they partook of the feast of that wicked one. [He said to them]: If so, those in Susa should have been killed, not those in other parts? They then said, Give your answer. He said to them: It was because they bowed down to the image. 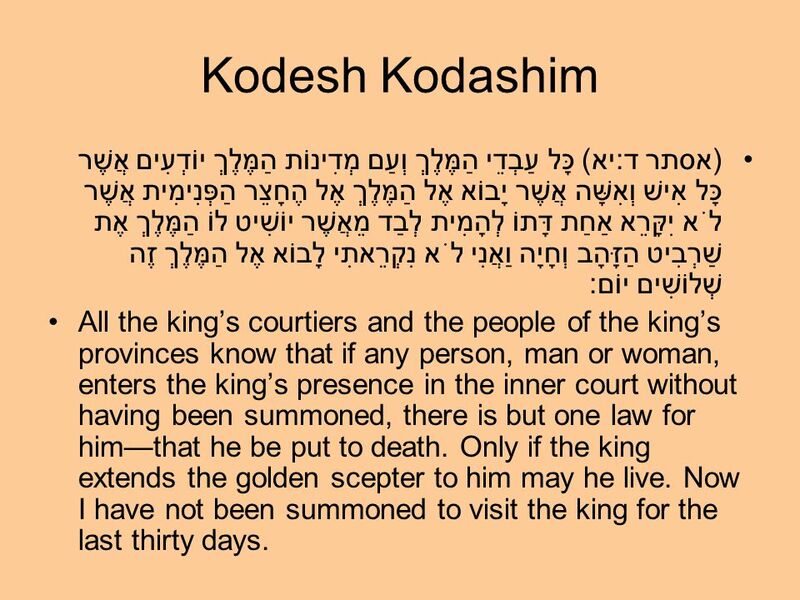 33 Kodesh Kodashim (אסתר ד:יא) כָּל עַבְדֵי הַמֶּלֶךְ וְעַם מְדִינוֹת הַמֶּלֶךְ יוֹדְעִים אֲשֶׁר כָּל אִישׁ וְאִשָּׁה אֲשֶׁר יָבוֹא אֶל הַמֶּלֶךְ אֶל הֶחָצֵר הַפְּנִימִית אֲשֶׁר לֹא יִקָּרֵא אַחַת דָּתוֹ לְהָמִית לְבַד מֵאֲשֶׁר יוֹשִׁיט לוֹ הַמֶּלֶךְ אֶת שַׁרְבִיט הַזָּהָב וְחָיָה וַאֲנִי לֹא נִקְרֵאתִי לָבוֹא אֶל הַמֶּלֶךְ זֶה שְׁלוֹשִׁים יוֹם: All the king’s courtiers and the people of the king’s provinces know that if any person, man or woman, enters the king’s presence in the inner court without having been summoned, there is but one law for him—that he be put to death. Only if the king extends the golden scepter to him may he live. Now I have not been summoned to visit the king for the last thirty days. 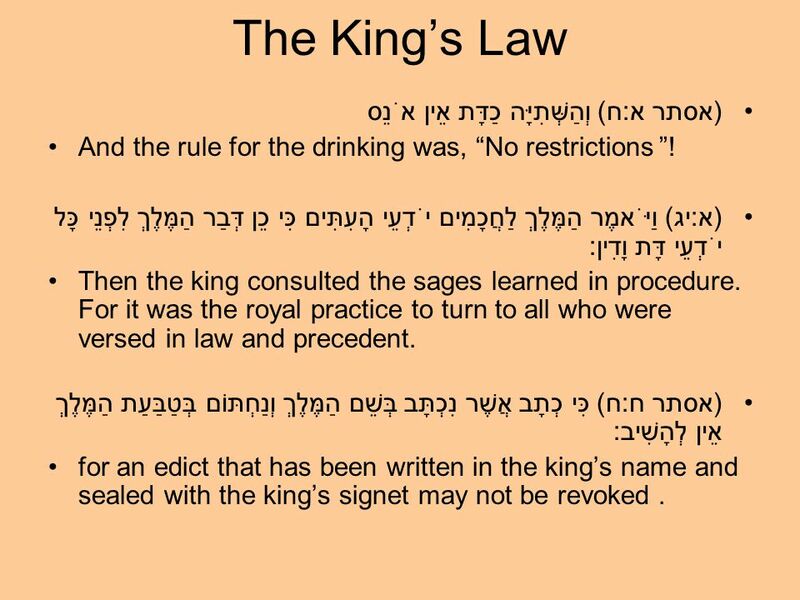 34 The King’s Law (אסתר א:ח) וְהַשְּׁתִיָּה כַדָּת אֵין אֹנֵס And the rule for the drinking was, “No restrictions!” (א:יג) וַיֹּאמֶר הַמֶּלֶךְ לַחֲכָמִים יֹדְעֵי הָעִתִּים כִּי כֵן דְּבַר הַמֶּלֶךְ לִפְנֵי כָּל יֹדְעֵי דָּת וָדִין: Then the king consulted the sages learned in procedure. 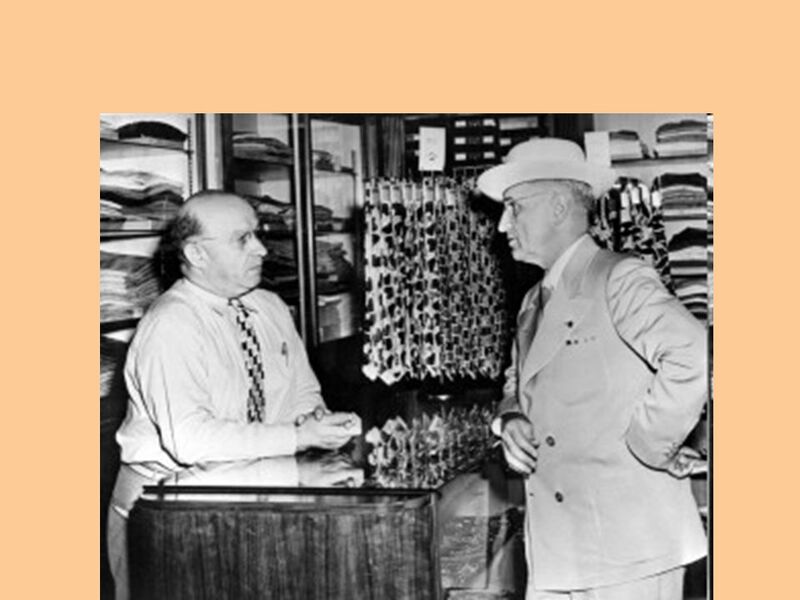 For it was the royal practice to turn to all who were versed in law and precedent. (אסתר ח:ח) כִּי כְתָב אֲשֶׁר נִכְתָּב בְּשֵׁם הַמֶּלֶךְ וְנַחְתּוֹם בְּטַבַּעַת הַמֶּלֶךְ אֵין לְהָשִׁיב: for an edict that has been written in the king’s name and sealed with the king’s signet may not be revoked. 35 תלמוד בבלי מסכת מגילה דף יד עמוד א רב נחמן אמר: קרייתא זו הלילא R. Nahman said: The reading of the Megillah is equivalent to Hallel. 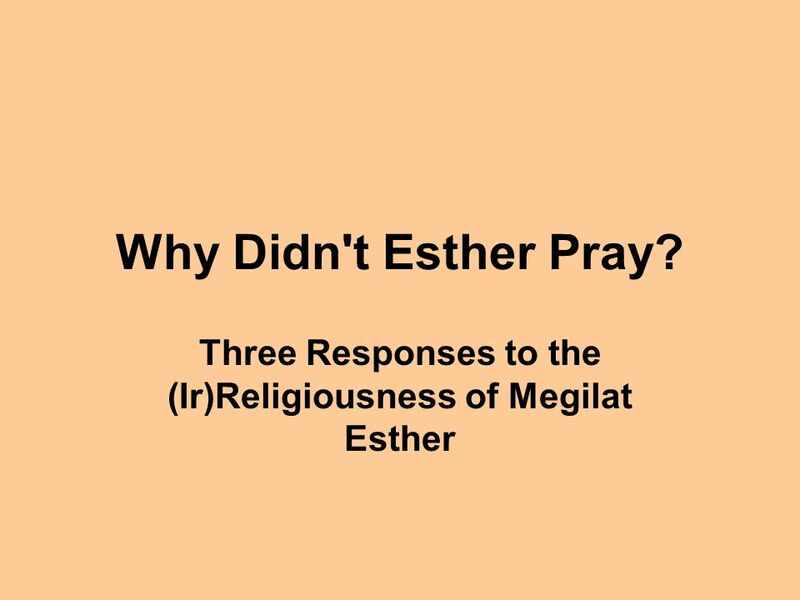 Download ppt "Why Didn't Esther Pray? 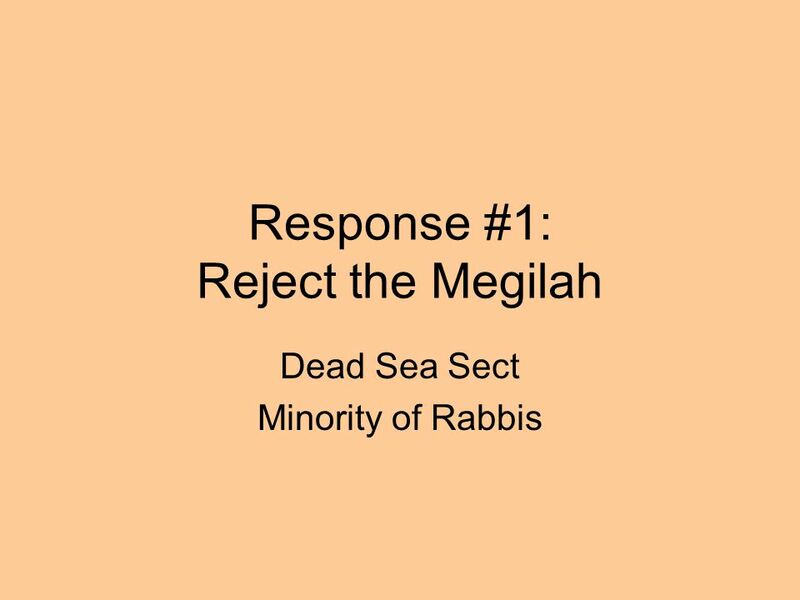 Three Responses to the (Ir)Religiousness of Megilat Esther." 1.I can be victorious because there is a God in heaven (Daniel 2:1-48). Arioch took Daniel to the king at once and said, I have found a man among the. We Would See Jesus John 12:20-26 Acts 17:4 And some of them were persuaded and joined Paul and Silas, as did a great many of the devout Greeks. The Last Supper © John Stevenson, Matthew 26:1-2 When Jesus had finished all these words, He said to His disciples, 2 “You know that after two days. Esther God’s invisible providential hand moves to save His people from complete destruction. MARY – GOD ’ S SERVANT Penge Baptist Church 18 th March 2012.